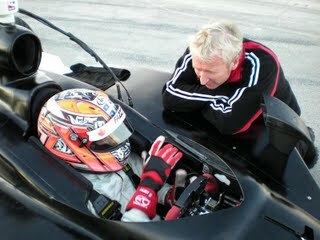 Indianapolis (Jan. 20, 2010) -The FAZZT Race Team and driver Alex Tagliani have finished their second and final day of testing at the 1.67 mile Sebring International Raceway road course. By all accounts, the team is very pleased with their first outing in road course configuration with the #77 Bowers & Wilkins FAZZT Race Team entry. "The test went incredibly well," said Alex. "I am at a loss of what to say because things really ran perfectly both days. The crew did a super job throughout the test and the car ran flawlessly over the 241 miles we ran. We really had no issues, no mistakes and that is just incredible when you take into account that we are basically running this car for the first time on a road course. We accomplished everything in our test plan and the crew even had time this afternoon to work on their pit stops which is just amazing considering everything we had to get done." The crew began their test on Monday morning with temperatures hovering in the low 70's and clear weather forecasted for the whole of the test. "It was another great test for the team and they really did not put a foot wrong over the course of the two days," explained General Manager Rob Edwards. "The dynamic between Alex and his engineer, Allen McDonald, has been awesome and Allen has done an excellent job of keeping the team on track and getting through our test plan. Between this test and our test at Homestead-Miami Speedway at the beginning of the month we have achieved way more than we had even hoped for and we are really looking forward to our next test at Barber Motorsports Park in mid-February." Alex and Rob both were enthused by the cohesiveness the first year team has been showing both in this test and in the previous test at Homestead-Miami Speedway. "It was nice to just be able to run and test everything we had planned on testing," explained Alex. "When you have these types of people around you who are so professional in what they do, you don't have to worry about a thing. When it's time to run the car, I run the car. When it's time to wait for changes, I wait. I don't have to worry about anything but driving and that is such a pleasure." Rob also was enthusiastic in his praise for the newly formed team. "Alex is as relaxed in the race car as I have ever seen him and everyone on this team is 100% behind the effort and that really makes all the difference. Everyone is very focused on their jobs and doing their part to make us competitive when we unload the car in Brazil on March 12 and it so apparent when you run a test where literally, there was not issue one with the race car." The team is now returning to Indianapolis to continue preparations for their next scheduled test which will be held on the road course at Barber Motorsports Park on February 24 and 25. The test at Barber Motorsports Park will be the final test before the season opening event for the IZOD IndyCar Series on March 14 in Sao Paulo, Brazil.